Dr Tim Patston is the Coordinator of Creativity and Innovation at Geelong Grammar in Victoria. This year, teachers across all the school’s campuses are completing training in Creative Education. In the first of two articles, Patston discusses why the school decided to take this approach to learning and outlines the process staff used to develop the framework. It is becoming increasingly clear, from both research and industry, that two key skills will be needed in order to flourish in the future – relationships and creative thinking. These skills enable students to be agile and adaptive in a changing world. Traditional hierarchical models of work are devolving into collaborative teams, where any individual is perceived to be able to make a contribution, if they have an open mindset and the right attitude. In schools this is mirrored in the rise of ‘student agency’, where students become active contributors to their processes of learning, rather than passive receptacles for knowledge. Creativity is the ability to identify and trial new solutions to problems within your own specific context. Skills associated with creativity include problem solving, convergent and divergent thinking, collaboration, and resilience. Geelong Grammar School is best known for its Positive Education program, which is now 10 years old. We have long understood the power of relationships. Our challenge for the next five years is to introduce Creative Education. Of course knowledge is important, and curricula are important. However, we believe it is more important for students to develop a toolkit of skills which they can apply to given situations. In 2017 all teachers across our campuses are completing training in Creative Education. We are using a blended learning approach, combining online study with meetings in small and large groups, within and across faculties to discuss the concepts and how they will be applied. When I began the process of researching the field of creativity, I realised that I already had a number of preconceptions. I thought that creativity was to do with the arts, and that only people with a special ‘talent’ were capable of being creative. As with many aspects of school education, I had developed a set of beliefs without any real knowledge. To my surprise (and relief) creativity is a well-researched topic in a number of fields; Engineering, Psychology, Business, and the Arts. There has been research into creativity in education since the 1960s. Unfortunately, a great amount of this was in the US, and dedicated to their ‘gifted and talented’ programs. What we needed to do was to translate the field into general education. In collaboration with leading academics from around the world and the staff at my school, we embarked upon developing what we call Creative Education. The result has been the development and implementation of a new model, the RISE Approach to Creative Education. The RISE Approach to Creative Education is based on well-established research and theory, both newly applied to the school environment and to Australian standards and practices. 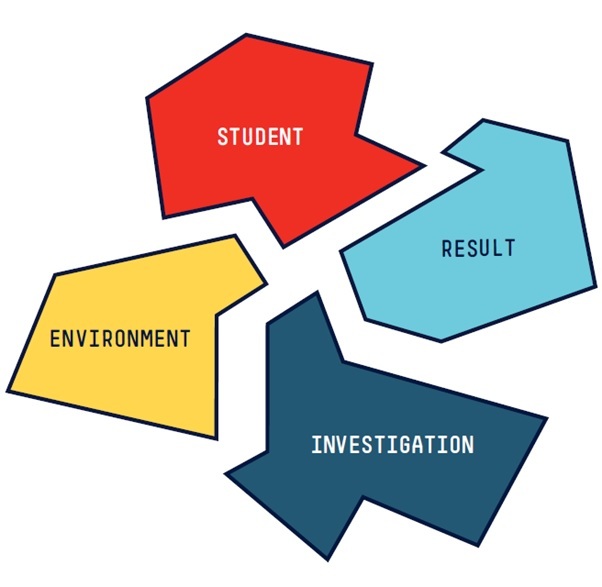 RISE essentially has four interconnected components: Results, Investigation, Student, Environment. Results are the eventual products or outcomes that are desired. Results could take the shape of student learning, student work, teacher lesson plans, or classroom experiences. Important concepts include how creative work is evaluated, how creativity can be included in rubrics or larger assessments, how peer-to-peer interaction can improve results, and how teachers are the most qualified people to rate student creativity. Investigation is the way that people create. People may investigate in many different ways, with individual preferences, styles, or strengths. Creative thinking skills (such as idea generation, evaluation, and iteration) are an important part of the investigation process. Investigation may happen alone, but there are many benefits to creating with peers in small groups. Teachers play a strong role in nurturing the creative process of students. Important concepts include different stages of the investigation process, the importance of teachers in nurturing student investigation, and how to construct groups with the best mix of diversity. A Student is anyone who benefits from a learning environment; teachers can be students, too! Each student has her or his particular strengths that can be used to enhance the learning experience. Important concepts include personality (such as openness to experience and conscientiousness), intellectual strengths (such as problem solving, memory, and knowledge retention), motivation, risk taking, resilience, and past experiences. Environment represents the different systems that may influence creativity (for example, whole school, family, social, classroom). Each environment can be influenced by many different variables, from the school administration to the available resources and technology, to the classroom atmosphere that is established by the teacher and students. Important concepts include creating and maintaining a supportive environment, nurturing creativity within prevailing constraints, and having each student feel that they are safe to be creative. In order for students to be upskilled in Creative Education, it was important to first train the teachers. In doing so, it was essential to show that the medium is the message in teaching. It is clear from the evidence that blended learning is the most effective method of teaching and learning. A series of online lessons were developed based on the RISE approach. The platform Stile was chosen for its flexibility and ease of use. Within each lesson there is a link to an online sharing site where staff can put up their observations on the lessons and talk about new ideas they have tried. Staff were encouraged to do the lessons in a variety of contexts, alone, in a pair or small group, within their own faculty, and with members of other faculties. This type of mixed grouping has been shown to generate fruitful discussion and new ideas. As an example, the problem solving method SCAMPER (Substitute, Combine, Maximise/minimise, Put to Other Use, Eliminate, Reverse) is in one lesson. For primary teachers this is a tried and trusted method, but was completely new to the senior school staff. This highlighted the idea that creativity is something new in a particular context. Finally, teachers are asked to trial new ideas in their classes as a part of our professional development program. These trials are using a method devised at Geelong Grammar School, Pop Up Pedagogy. Teachers try one new idea in one class for one month. Failure is an option, and is treated as a part of the learning experience. All projects are shared on a website for others to look at and try for themselves. Stay tuned: In tomorrow’s article, Dr Tim Patston will explore specific examples of how the RISE Approach to Creative Education has been working for students and teachers. How are you helping students to develop ‘soft skills’ such as creativity and problem solving? As a principal, do you encourage the use of research-based teaching practices across the school? Do you encourage teachers to trial new ideas and share the results?